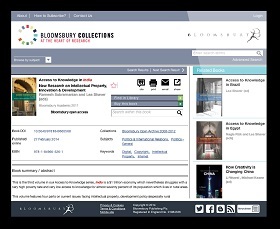 Bloomsbury Collections delivers instant access to quality research and provides libraries with a flexible way to build eBook collections across the humanities and social sciences. It contains over 6,000 titles, featuring content from Bloomsbury’s latest research publications as well as a 100+ year legacy including Continuum, T&T Clark, Bristol Classical Press, Berg, The Arden Shakespeare and Hart Publishing. Options are flexible to help librarians complete their collections by subject, collection year, or selected series. See collections page for more about available collections. Titles are now also available to be purchased individually, on a title by title basis, by institutions globally. This new purchase model allows our customers increased flexibility to gain access to Bloomsbury’s scholarship and emphasizes our commitment to customers and the global market demand to acquire titles on an individual basis. See the how to order page for the full title list and contact information.